Holiday shopping time! It's a little rough every year - agonizing over finding the perfect gifts for your loved ones, wondering if you'll be able to find that special thing in time. Of course, this year is a bit more difficult, since so many of our wallets are, well, emptier than usual. It's times like this you want to know the money you spend is going to make your loved ones smile. That's why we're here with our holiday shopping guide all this week. Each day carries a different theme, representing different sorts of people with great gifts sure to be winners. Just find the days that best match your giftees and buy with confidence. Happy holidays! For an overview of our 2008 Buyer's Guide, click here. Your tastes have been refined by years and years ... and years of playing games. You've played all the other games on this list already. You're looking for something a bit more special, a bit off the beaten path, something you can show your friends you really know the unique and special games. How can you have yourself a merry little Christmas? Pluck one of these 2008 gems off the shelf. Being a modern Japanese youth has nothing to do with samurai swords and even less to do with mournful shamisen notes. For most, life takes place in one of the many megalopolises that have consumed Japan. The World Ends With You is a role playing game about precisely that. Set in the Shibuya district of Tokyo, the game features many real world locations that will be familiar to anyone who has been and fascinating for those who haven't. This game also features two of the Japanese' greatest fixations: alienated spiky-haired anti-heroes and shopping for the trendiest brand names. With a spastic combat system that involves controlling two characters at once and an attractive J-Pop soundtrack, this game looks and feels refreshingly new, and intoxicatingly foreign. 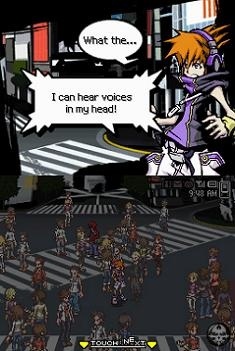 The World Ends With you is a great game and a brilliant reminder of the kind of work Square-Enix is capable of in between the endless barrage of ports and remakes. Up next: Saving the world from aliens, one turn at a time.